Chicken sausage and pepper pie is a Mexican inspired comfort food that the whole family will love. Black beans, kale, onions, and a homemade crust make this a delicious and healthy dinner idea. Ready for a flavor explosion? What is in a meat pie? Most meat pies contain a few basic ingredients that fall into these categories. Vegetables: onions are frequently included, along with other veggies like carrots, celery, potatoes, or turnips. Spices: usually salt and black pepper, plus additional spices to enhance the flavors present. Sauce: some meat pies contain a gravy or cream sauce to keep the filling moist. Pastry: the most common choices are shortcrust and puff pastry (or homemade rough puff pastry). How do you make a sausage pie? Measure out all the filling ingredients, and make sure you have the pastry chilling in the fridge. Fry the onions and garlic in 1 tablespoon of olive oil until golden. Add the peppers and seasonings and cook until the peppers are soft. Dump in the kale and cook until the kale has wilted and all the liquid has evaporated. Mash half of the black beans until smooth. Stir in the rest of the beans, the lime juice, lime zest, a dash of salt, and a splash water. Mix all the cooked veggies, mashed beans, and diced sausage until well blended. Adjust seasonings to taste, then put the filling in a 9-inch pie dish. Brush the lip of the pie dish with beaten egg, then place a strip of pastry around the rim. Brush the pastry strip with more beaten egg and top with the remaining pastry. Press around the edges to seal, then crimp the edges and cut a few vent holes in the top. Bake the pie at 400 F for about 40 minutes, until well browned. Do all the prep work before you start cooking. It ends up saving time and makes the cooking process go so much smoother. Taste the filling and adjust the seasonings to your taste. You can make it spicy if you’d like with additional cayenne pepper. Make the filling ahead of time if you’re in a hurry; just store in the fridge until you need it. Just put pastry on the top of the pie. The filling produces liquid as it cooks, which would make a bottom crust soggy. Be sure the filling isn’t piping hot when you put the pastry on top, or it could melt the fat in the pastry. Store any leftover pie covered in the fridge for up to 3 days. This chicken sausage and pepper pie is a wonderful celebration of Mexican flavors. Won’t you give it a try? Here’s some more ideas for yummy sausage dinners. 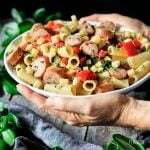 Pear, Gouda, and Chicken Sausage Rigatoni: a 45-minute dinner that’s packed with color and vitamins. Low Carb Italian Sausage, Peppers, and Onions: this one-hour dinner recipe will appeal to kids and adults alike. One Pot Creole Jambalaya: a super easy dish that’s full of wonderful Creole flavor. We’d love to hear how you enjoyed this chicken sausage and pepper pie! Please leave a recipe rating below. Chop the onion and mince the garlic and cilantro. Dice the peppers and sausage, drain and rinse the black beans, zest the lime, and squeeze the lime juice. Heat 1 tablespoon of olive oil in a cast iron skillet over medium-high heat. Once the pan is hot, turn down the heat to medium and add the onion. Cook until soft, then add the garlic and stir continuously until the onion is golden, about 5 minutes. Add the red and yellow peppers and spices and cook until the peppers are soft, about 3 minutes. Dump in the cilantro and kale, and cook until the kale is wilted and all any liquid has evaporated. Remove the pan from the heat. Mash half of the beans, then season it with a dash of salt and the lime juice and zest. Stir in a tablespoon of water to thin the mash, then mix in the remaining black beans. Stir together the cooked vegetables, bean mixture, and diced sausages until well mixed. Adjust seasonings to taste. Spread the filling in a 9-inch pie dish and set aside to cool a little. Roll out the pastry on a lightly floured surface until it’s 1/8 inch thick. Using a plate as a template, cut a circle of pastry just large enough to cover the pie dish. Cut the remaining pastry into strips the width of the dish’s lip. Brush the lip of the pie dish with beaten egg and stick the pastry strips onto it. Then, brush the pastry rim with beaten egg and top with the pastry lid. Press down the edges to seal, then crimp the edges and cut several vent holes in the lid. Bake the pie at 400 F for 40-45 minutes, until the pastry is golden brown. Let the pie cool on a wire rack for 10-15 minutes before serving. If you’re in a hurry, make the filling ahead of time and refrigerate until needed. Be sure the filling isn’t piping hot when you put the pastry on top, or it might melt the butter in the pastry. Store leftover pie covered in the fridge for up to 3 days.